Amazing that after all of these years of research, and with proven facts presented in both physical and audio to the public, made by both Black & White jazz musicians at the birth of Jazz….that the stereotype make up history presented by Ken Burns historical fantasy, still has legs. I have been a huge Freddie Keppard fan for most of my life. And there is no doubt he didn’t get his due. And yes..like most New Orleans Creole Musicians…Jelly, Bechet, etc…Freddie was full of himself. And like Jelly & Sidney…he was a hell of a player. 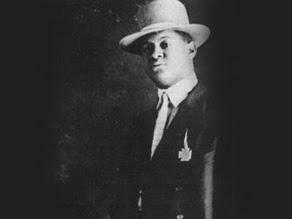 He made a horrible mistake of hopping onstage to cut Louis Armstrong when Pops was in his 1920’s prime, and like the other fools who tried to do the same, tried to crawl off the stage to hide the shame and lick their wounds. But to put down the Original Dixieland Jazz Band…and the talents of Nick LaRocca, Larry Sheilds, Eddie Edwards, etc., as pale imitators of Black originators is pure Bunk, and I don’t mean Johnson either! Take the time to go to New Orleans and visit the Hogan Archives at Tulane, and give a listen to, or read…the actual words of those who were there and making the at that time, both Black & White. And you will learn what Ken Burns left out of his PC Fantasy and why. No matter what however…Long Live Freddie Keppard! There has been a lot of ink spilled about the ODJB’s session of February 26, 1917 though, and there has even been discussion about whether we can in fact call the fruits of that session the very first “jazz” record. As for the ODJB not improvising, multiple takes do reveal that the ODJB “routined” a lot of their music, the same as MANY musicians of that time. I’ll leave it up to other forums to determine whether that makes them “jazz” or not. The point being was that it was not my intent to take any side on the ODJB debate, and certainly not to put them down. I have added further scare quotes to this post to denote others’ descriptions of this band. Either way, thank you for your thoughtful, passionate comment, and for reading. It is ALWAYS a good idea to research and above all to listen. And of course, long live Freddie Keppard!